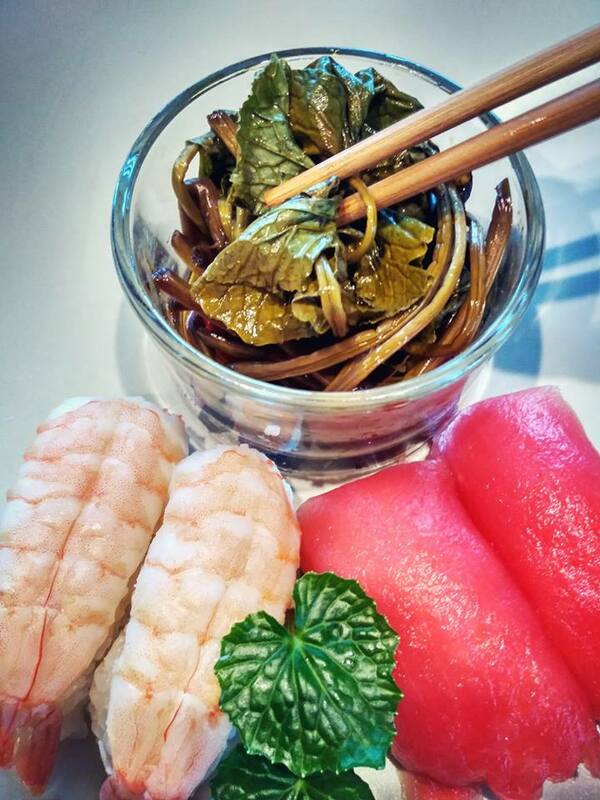 Proven recipe for pickled wasabi leaves, a perfect addition to rice, sushi, sashimi or as a sake appetizer. An important step is to prepare the plant to bring out its natural spice. Wasabi leaves are mild in a raw state. To get the desired sharpness, you need to properly blang them. Leaves are best cut into pieces easy to eat - about 3 cm or leave them whole if they are small, leaves are thrown into water at a temperature of 80 degrees (not for boiling water) and drained after 10 seconds. After straining the leaves (you can additionally hold them with your hands to get rid of excess water. It should be translated into a bowl and covered with salt. We give about 1/2 teaspoonful of salt on 500g of fresh leaves. Wash the leaves with salt thoroughly by squeezing them with your hands. (Like cabbage with salt for salad). The leaves so prepared are transferred to a glass jar with an airtight lid or a cap. We close and leave for about 3 hours. After 3 hours, the leaves should become sharp. During this time, we combine the components of the lagoon. If the alcohol content is a problem then sake and mirin cook for a while and then add to the other ingredients. Pour the marinade into the jar with leaves and mix. Put the jar in the fridge. The silage is ready after one day. It should be stored in a refrigerator and used within 2-3 weeks. In order not to lose the strong aroma of wasabi, the jar must be closed tight every time.